Hey! Manchester promotes gigs by folk, Americana and experimental bands from around the world in Manchester, England. Read more here, see below for our latest shows, check out our previous shows, contact us, or join our mailing list, above. We’re delighted to be working with Rachael Yamagata again – with guests Brandon Jenner and Caoilfhionn Rose! Since Rachael Yamagata first broke onto the music scene with her critically acclaimed debut album Happenstance, she has shed her skin as the ‘troubadour of heartbreak’, emerging with an edge-laden sound characterised by universal themes of perseverance, compassion, and owning your own power. 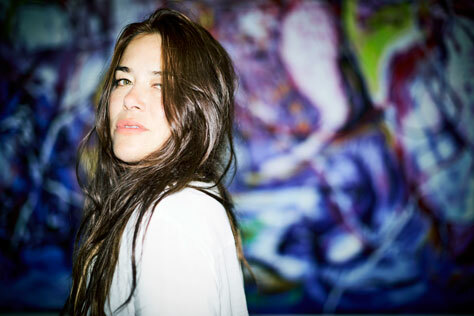 In Autumn 2016 Rachael Yamagata released her most recent album Tightrope Walker, via Frankenfish Records/Thirty Tigers worldwide, and went on the road as far as China. Her career has been punctuated by three previous albums, five EP releases and various collaborations with the likes of Ryan Adams, Bat for Lashes and Ray LaMontagne, but the Virginian singer-songwriter chose to challenge herself thematically with this new album. This decision was, in part, induced by Philippe Petit – the French high-wire artist famed for tightrope walking between the two World Trade Centres in 1974 – who, when asked why he performed such a feat, simply responded ‘there is no why’. An album that challenges style and genre as much as themes, Tightrope Walker features a wealth of audible features, some more unusual than others. Saxophones, mandolins, rain recorded on an iPhone, French spoken word, metallic ironing boards and ladder drums, myriad harmonies and loops all signal change and development in Yamagata’s songwriting. Tour support comes from Brandon Jenner. Opening the show is Caoilfhionn Rose. Caoilfhionn (pronounced Keelin) Rose is a singer-songwriter from Manchester. Part of several collaborations, she featured on The Durutti Column‘s 2014 album Chronicle LX:XL. With an eclectic taste in music, her influences range from The Mummers to Polly Paulusma to Broadcast to Rachel Sermanni, Peter Broderick and many more. Caoilfhionn is currently recording her debut album with Matthew Halsall of Gondwana Records. This show is a co-promotion with Velveteen Music. Buy tickets now. Tickets are available from Piccadilly Records, Vinyl Exchange, Seetickets.com, Ticketline.co.uk and on 0871 220 0260. All shows are 18+ unless otherwise stated. Read our monthly gig guides on Creativetourist.com.